Make her happy with this bracelet which will go perfectly with any outfit, both during the day and at night. An acclaimed, original piece of jewelry from the world renowned Folli Follie is a perfect gift for your special lady. 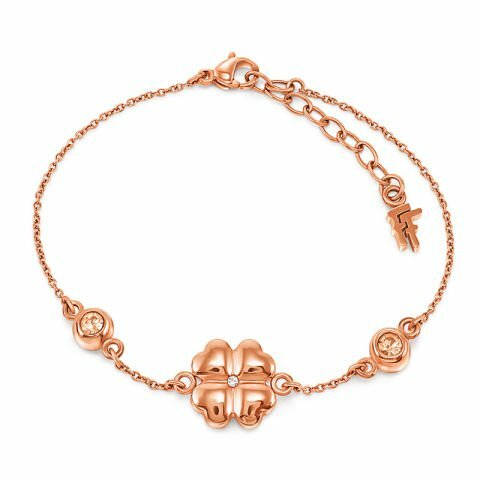 The central clover is framed by two gleaming champagne-colour crystals which give elegance and sofistication to this bracelet. If you're looking for jewelry which is original yet discreet, dazzling yet unextravagent, then this is the perfect option to surprise that special lady in your life. An original piece of jewelry from Folli Follie's Heart4Heart Mini collection.